We have already learned the concept of area of a rectangle and solved sample problems about it. In this post, we continue the rectangle area problems series. We discuss three more problems about rectangle area. The fourth problem below involves area preservation, the fifth is calculating the area given its perimeter, and the sixth requiring the use of quadratic equations. 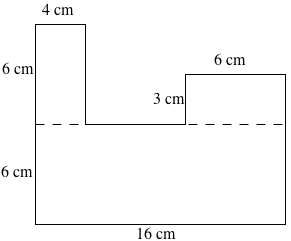 What is the area of the figure below? The figure above can be divided into 3 rectangles. One way to do this is to draw the dashed line below (can you find other ways?). Notice that drawing the lines give us rectangles with dimensions 6c m by 4 cm, 6 cm by 3 cm, and 6cm by 16 cm. Now, the area of the figure is the sum of the areas of the three rectangles. Area of a 6 cm by 4 cm is 6 cm × 4 cm = 24 square cm. 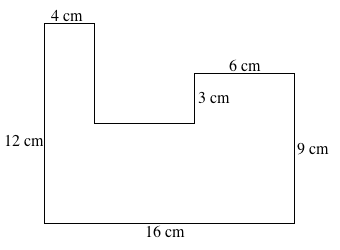 Area of a 6 cm by 4 cm is 6 cm × 3 cm = 18 square cm. So, the area of the figure is 24 + 18 + 96 = 138 sq. cm. The perimeter of a rectangle 54 cm. Its length is twice than its width. What is its area? P = 2l + 2w. 54 = 2(2x) + 2x. resulting to x = 9. Therefore, the width is 9 and the length which is twice the width is 18. So, the area is 9(18) = 162 sq. cm. The length of a rectangle is 5 more than its width. Its area is 84 square centimeters. What are its dimensions? This problem can be solved using guess and check but I wouldn’t recommend it. For example, you can choose two numbers where one is 5 greater than the other and find their product. Choosing 4 and 9 results to the product 36. It is quite small, so you might want to try 10 and 15 but the product is 150, quite large, so, you can go down, and you will eventually find 7 and 12 which is the correct answer. Another guess and check strategy in this problem is to find the factors of 84 (left as an exercise). Now, remember that guess and check does not always work and it takes time, so you better learn the solution below. which gives us which is its width. This also gives us the length x + 5 = 12. This solution which uses quadratic equation is a bit advanced, but there is no way that you can solve problems like the one above if you don’t know it. I am afraid that you have to learn it again if you have forgotten it. You must practice factoring and memorize the quadratic formula (I will discuss this after this series). Then and only then, that you would be able to solve such problems with better speed and accuracy. If you encounter problems such as this and you don’t know what to do, it is important that you do not spend too much time on them. Just guess the answer first, mark them, and come back to them when you still have time at the end of the exam. However, be sure not to skip too many items. In the next post, we will have a quiz on solving rectangle area problems.